So far Maikel has created 14 blog entries. 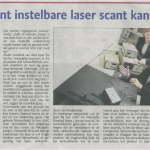 Eindhoven´s Dagblad published an article on the edocal project. 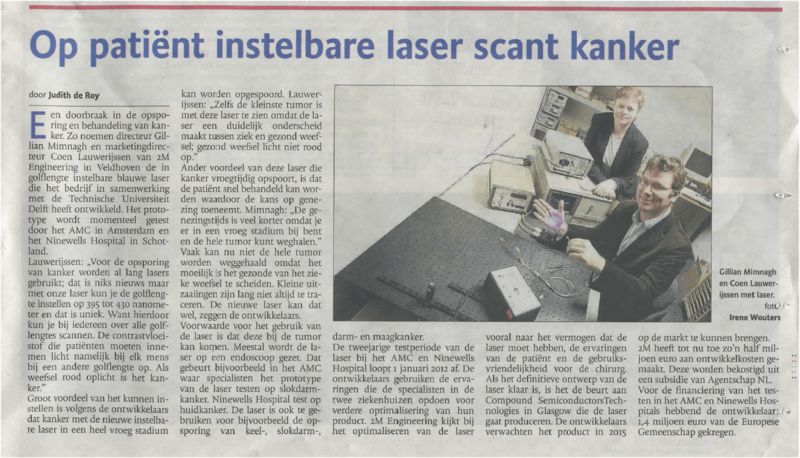 A light based cancer detection solution with wide practical application. 2M welcomes Zameed SahebAli who will become responsible for mechanical engineering. Zameed spent 8 years working at Biosensors International in technical and managerial functions. 5 years as medical device product developer and project leader, 3 years as Manager Research & Development of the Catheter Division. We are very pleased Zameed has joined 2M. See www.vitamove.nl for more detailed information about benefits, how it works, application areas and so on. The first batch of single mode laser for the PhoCryLa project have been produced and successfully tested. The laser will be used to build devices to non-invasively test glucose levels in people with diabetes. The great advantage of being able to use a laser to do this is that no blood has to be drawn from the patient. This work is carried out with support from the International Innovation Co-operation funds from Senter Novem. 2M is starting production of Skunkx. Skunkx are heated shoes that stimulate your bloodcirculation. See www.skunkx.com for more information. Angelina, the next generation of blood centrifuges has been approved for R&D funding. Fully integrated and completely automatic, Angelina offers controlled whole blood seperation and onboard autologous platelet rich plasma leukocyte gel production. The product will revolutionise treatment enabling new and simplyfying existing medical procedures. 2M Engineering participates in the “XIX Conferenza Biennale della International Society for Posture and Gait Research” in Bologna, Italy. The conference takes place 21-25 June 2009. 2M Engineering will demonstrate the latest VitaMove product & VitaScore software developments. Find out more about VitaMove..